Ossian purports to be a translation of an epic cycle of Scottish poems from the early dark ages. Ossian, a blind bard, sings of the life and battles of Fingal, a Scotch warrior. Ossian caused a sensation when it was published on the cusp of the era of revolutions, and had a massive cultural impact during the 18th and 19th centuries. 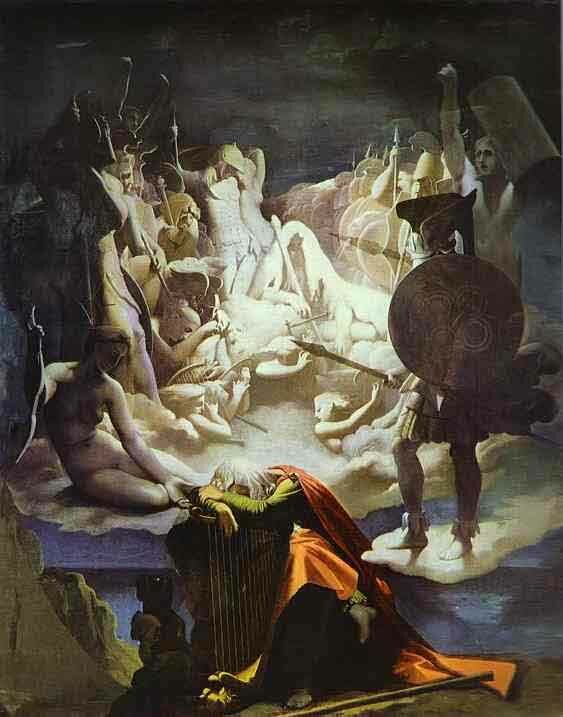 Napolean carried a copy into battle; Goethe translated parts of it; the city of Selma, Alabama was named after the home of Fingal, and one of Ingres' most romantic and moody paintings, the Dream of Ossian (above) was based on it. James Macpherson claimed that Ossian was based on an ancient Gaelic manuscript. There was just one problem. The existence of this manuscript was never established. In fact, unlike Ireland and Wales, there are no dark-age manuscripts of epic poems, tales, and chronicles and so on from Scotland. It isn't that such ancient Scottish poetry and lore didn't exist, it was just purely oral in nature. Not much of it was committed to writing until it was on the verge of extinction. There are Scottish manuscripts and books in existence today which date as far back as the 12th century (some with scraps of poetry in them), but they are principally on subjects such as religion, genealogy, and land grants. For this and several other reasons which are dealt with in the Preliminary Discourse et seq., authenticity of the work was widely contested, particularly by Samuel Johnson. A huge (and probably excessive) backlash ensued, and conventional wisdom today brands Ossian as one of the great forgeries of history. In fairness, themes, characters and passages of Ossian are based on established Celtic and Scottish folklore. Much of the fourth volume of J.F. Campbell's massive Popular Tales of the West Highlands is devoted to tracking down Ossianic fragments in circulation prior to Macpherson, or elicited from illiterate Highland peasants who had never heard of Ossian . Macpherson is today considered the author of this work. The language of composition was probably English: As Campbell determined, Macpherson wasn't even particularly fluent in Gaelic. The work has literary merits, and historical importance. The project resembles other Romantic era attempts at national epic-building such as the Finnish Kalevala; however the Kalevala is acknowledged to be based on years of ethnographic fieldwork by Elias Lönnrot. Lönnrot is now believed to have composed a few bridge portions of the Kalevala; but he didn't pull a great deal of the work out of thin air, as did Macpherson. Production notes: This version is based on material produced by Donal O'Danachair. Be sure to visit his website (exclassics.com)--highly recommended! I've scanned and proofed about 200 pages of prefatory material, added the original illustrations and page numbers; corrected some typos and added a few missing footnotes to the exclassics etext.